Point Pleasant freshman Mitchell Freeman locks in a hold on a Huntington opponent during a 120-pound match held on Dec. 6 in Point Pleasant, W.Va.
CLENDENIN, W.Va. — More highs than lows … even though they ended up in the middle. 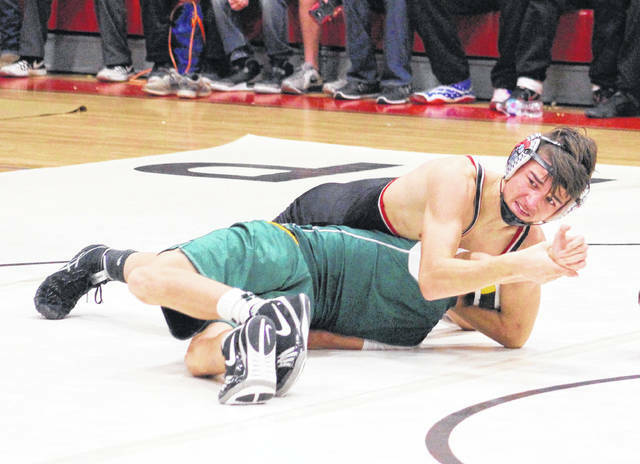 The Point Pleasant wrestling team went 1-1 overall and posted 15 wins in 28 total contests on Thursday night during a tri-match against Independence and host Herbert Hoover in Kanawha County. The Big Blacks went 11-3 while earning a 57-15 victory over the Huskies, but the defending Class AA state champion Patriots won 10 of their 14 matches against PPHS en route to a 53-19 decision. No final tally was available for the IHS head-to-head match with Herbert Hoover. A trio of Point grapplers finished the night with perfect 2-0 marks, with Justin Cornell (106 pounds), Isaac Short (113) and Mitchell Freeman (126) all going unblemished in their two matches. Cornell scored a 10-1 major decision against IHS and won by forfeit versus the hosts, while Short claimed a 5-4 decision against Independence and earned a pinfall win over the Huskies. Freeman landed a forfeit win over the Patriots and scored a pinfall win over HHHS. Logan Southall (160) and Jacob Bryant (170) also went 1-0 on the evening, with both wins coming against the Huskies. Southall scored a pinfall win and Bryant landed a 6-4 decision. Conrad Berkley (120), Wyatt Wilson (138), Zac Samson (145), Jake Roub (152), Juan Marquez (195), Dakota Moses (220) and Jacob Muncy (285) all went 1-1 overall, with all of them scoring wins against HHHS except Moses. Wilson and Marquez both won by pinfall, while Roub and Muncy won decisions by respective counts of 4-2 and 2-1. Berkley and Samson also won by forfeit, with Moses claiming a pinfall win against Independence. Riley Oliver (132), and Clayton Hill (182) lost both of their head-to-head matches. Nazar Abbas (170) also dropped his only match of the evening against IHS. The Big Blacks also forfeited the 160-pound contest against Independence. Point Pleasant returns to action next Thursday when it travels to Wirt County.